(Nanowerk News) Using precision techniques for making superconducting thin films layer-by-layer, physicists at the U.S. Department of Energy’s (DOE) Brookhaven National Laboratory have identified a single layer responsible for one such material’s ability to become superconducting, i.e., carry electrical current with no energy loss. The technique, described in the October 30, 2009, issue of Science, could be used to engineer ultrathin films with “tunable” superconductivity for higher-efficiency electronic devices. In 2008, Bozovic's team reported discovery of interface high-temperature superconductivity in bilayer films of two cuprate materials, one a metal (M) and the other an insulator (I). Now they show that zinc doping dampens superconductivity (see drop in transition temperature indicated by blue line) only when placed in the second cuprate layer (highlighted) above the interface. Hence, this particular layer, less then 0.7 nanometers thick, is solely responsible for the materials high-temperature superconductivity. The result opens prospects for tunable superconducting electronic devices. The thinner the material (and the higher its transition temperature to a superconductor), the greater its potential for applications where the superconductivity can be controlled by an external electric field. “This type of control is difficult to achieve with thicker films, because an electric field does not penetrate into metals more than a nanometer or so,” Bozovic explained. To explore the limits of thinness, Bozovic’s group synthesized a series of films based on the high-temperature superconducting cuprates (copper-oxides) — materials that carry current with no energy loss when cooled below a certain transition temperature (Tc). Since zinc is known to suppress the superconductivity in these materials, the scientists systematically substituted a small amount of zinc into each of the copper-oxide layers. Any layer where the zinc’s presence had a suppressing effect would be clearly identified as essential to superconductivity in the film. “Our measurements showed that the zinc doping had essentially no effect, except when placed in a single, well-defined layer. When the zinc was in that layer, the superconductivity was dramatically suppressed,” Bozovic said. The material studied by Bozovic’s team was unusual in that it consists of layers of two materials, one metallic and one insulating, that are not superconductors on their own, but rather exhibit superconductivity at the interface between them. 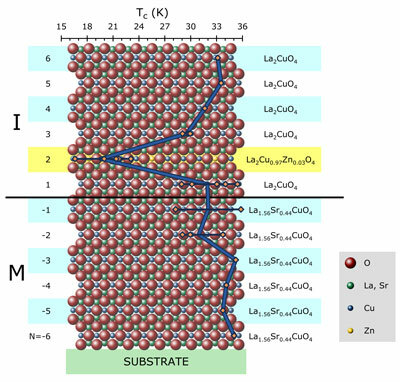 The layer identified as essential to the superconductivity by the zinc-substitution experiment represents the second copper-oxide layer away from the interface. The scientists found that the presence of zinc had no effect on the transition temperature at which superconductivity sets in, about 32 kelvin (-241 Celsius), except when placed in that particular layer. In the latter case, the scientists observed a dramatic drop in the transition temperature to 18 kelvin (-255 Celsius). The reduction in transition temperature provides a clear indication that that particular layer is the “hot” one responsible for the relatively high temperature at which superconductivity normally sets in for this material. Bozovic explained that, in the material he studied, the electrons required for superconductivity actually come from the metallic material below the interface. They leak into the insulating material above the interface and achieve the critical level in that second copper-oxide layer. But in principle, he says, there are other ways to achieve the same concentration of electrons in that single layer, for example, by doping achieved by applying electric fields. That would result in high-temperature superconductivity in a single copper-oxide layer measuring just 0.66 nanometers. From a practical viewpoint, this discovery opens a path toward the fabrication of electronic devices with modulated, or tunable, superconducting properties which can be controlled by electric or magnetic fields. “Electronic devices already consume a large fraction of our electricity usage — and this is growing fast.” Bozovic continued. “Clearly, we will need less-power hungry electronics in the future.” Superconductors, which operate without energy loss — particularly those that operate at warmer, more-practical temperatures — may be one way to go. Bozovic’s layer-by-layer synthesis method and ability to strategically alter individual layers’ composition might also be used to explore and possibly control other electronic phenomena and properties that emerge at the interfaces between layered materials.